Bulbine frutescens is native to desert grasslands in South Africa, this plant grows well in a well-drained soil and is also very tolerant of poor, dry soil. Be careful not to over water. 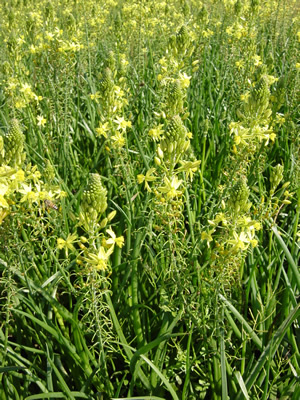 Bulbine grows best in full sun, has succulent foliage, and produces racemes of star-shaped yellow flowers in the summer months, around 10-15 stalks per plant. Bulbine can withstand a light frost, keep protected in colder climates. Yellow African Bulbine is also known as Bulbinella and Burn jelly plant, the sap in the leaves is used for healing in South Africa. Bulbine frutescens can reach 1.5′ tall with a 2′ spread, the flowers are held 2-3′ above the foliage.